Don't forget our special "collaborative" meeting on the 17th! "I have been creating paper mache sculptures since the 1980’s. About 7 years ago I became interested in books as ready made sculptural objects that I would alter. 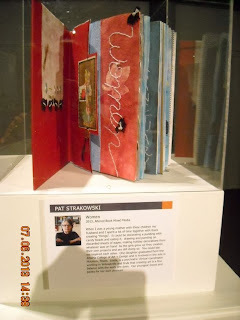 My love of embellishing my artworks give each book its unique persona as I develop its pages and cover. I am never in a rush to finish the book I am working on. For inspiration I look for the unusual ." 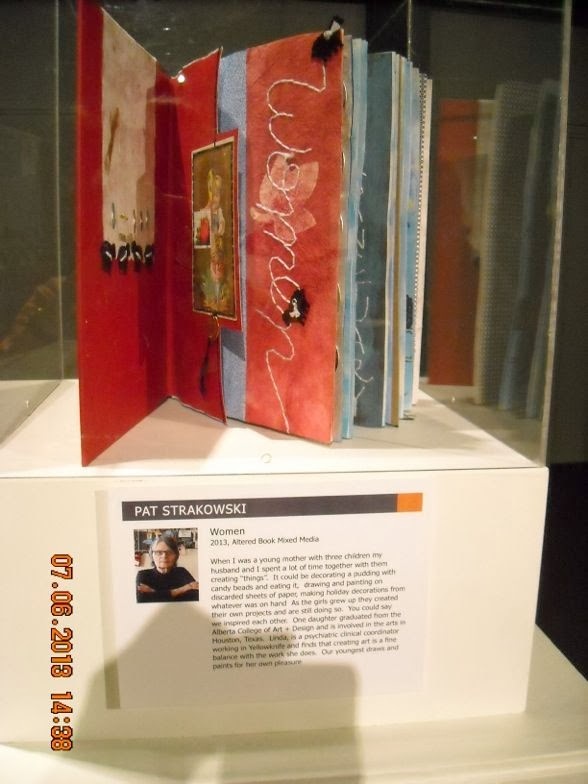 Pat also has a book, available here, about her work. Again, we are reminding members to please send information, photos and news to keep everyone apprised of what is happening. It's in your best interests to publicize yourselves!!!! Don't hide your lights under a bushel basket: share or i'm going to start emailing you one by one and cajoling and flattering you with questions! P.S. A "label" widget has been added to the side bar, so you can more easily find specific topics. Plus a special announcement of funding opportunities by CADA for artists....Don't miss it! It's the Grand Opening of Art Box on 17E - check out the transformation and the possibilities. What was an empty building and former paint store to a thunderbolt of exploding ideas and dynamic art, music & shows. Art Box on 17E is a project of International Avenue BRZ and Calgary Arts Development Authority. Some of these have been highlighted in previous posts, but are reminders to you. 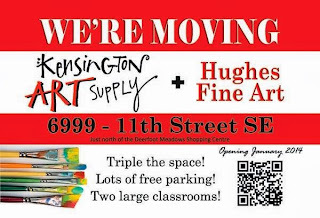 UAS is excited to announce the creation of 5 new studios in the upper-level of Satellite Gallery! Studio will be roughly 200 square feet, and priced at roughly $260.00 - depending on size and actual square footage. These studios will be available starting November 1st. 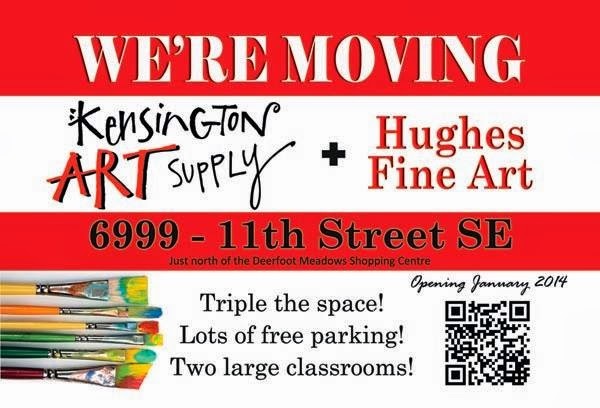 To book a viewing, please email info@uascalgary.org Learn more about these spaces. We create art in a time of digital literacy. In this course you will learn how to use online tools to market your work and yourself. The goal is to engage your target market, interest the media and establish yourself as a professional in your field. You will learn how to use Twitter, Facebook, LinkedIn and a blog to make important connections and attract interest to your work. To top it all off, you will leave the course with a plan to automate these networks so you still have time to make your art! Learn more about this class and others here. Most of us have struggled with writing artist statements, bios and CV's. What information is important? What's the difference between a statement and a bio? Why do i need a CV? From a Vancouver blog focusing on art and art business, lots of information. Click on the appropriate tag for a wealth of tips and practical advice. And from a different site, why do you need an art statement at all? Need to stock up on stash? Location: Millarville Racetrack located 20 minutes SW of Calgary, near the intersection of Highways 22 and 549E. One of a kind finds from local artists! Sheep Creek Weavers, a local fibre arts guild is hosting their ever-popular annual show and sale, Sat. Oct 19 at the Millarville Racetrack, 10 am - 4 pm, with free admission and Tea room. This is a wonderful opportunity to purchase unique handmade art pieces directly from the artists. Enjoy the country drive and down-home hospitality (just in time to beat the holiday shopping). You'll find a range of beautiful woven, felted, quilted and knitted items and garments, handspun yarns, wall hangings, see a fashion show and gallery of selected pieces from our guild's celebrated artists. The CCF/FCMA and the Craft Council of British Columbia (CCBC) invite you to Vancouver for the 10,000 Hours: Craft Invested Conference. From October 17th to the 20th, 2013, the CCBC will present a wide variety of lectures, panel discussions, workshops, exhibitions and a gala fundraiser supporting the work of the CCBC during their 40th Anniversary year. Conference discussions will be lively, touching on topics such as 'Craft - Origin, Place and Influence', 'Craft and Cultural Migration', 'The Function of Function', 'Craft: A Scary Word', and, closing out the conference, the CCF/FCMA's own National Symposium titled 'Connection & Collection', featuring Dr, Sandra Alfoldy (NSCAD University), Victoria Henry (Canada Art Bank), Jonathon Bancroft-Snell (Jonathon Bancroft-Snell Gallery) and Denis Longchamps (Craft Journal and the Burlington Arts Center). With over fifty speakers in total, it will be a whirlwind of debate! Each panel is $20 per person, or a two day pass can be purchased for $130 (for CCBC Members) or $145 (for non-members). The CCF/FCMA National Symposium is not included in the two day pass, but is a separate $20 ticket for the event, which runs 6-9pm on Saturday, October 19th. Check out the full schedule of events and register online today!